Refill for catalytic lamp 500 ml, to be used only with lamp and/or burner Crespi Milano. Place the catalytic lamp on a steady surface, away from any heat. 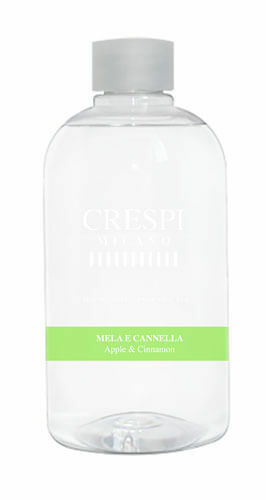 Using the funnel, fill 2/3 of the lamp with a Catalytic fragrance Crespi Milano. When using a new lamp insert the catalytic burner into the lamp, place the small snuffer cap on top and leave it to soak for at least 20 minutes. Uncover the snuffer cap and light the burner. Do not leave a burning lamp unattended as the flame may reach 5”. Blow out the flame after 2 to 4 minutes. Place the decorative cap on top . The catalytic lamp is now active, it is absorb odours and scents your home. To stop the scents, remove the decorative cap ( CAUTION this may be hot ) and cover the burner with the snuffer cap. Leaving the lamp actively working for 15 mins is usually enough for a medium-sized room.